The Gemini horoscope 2015 predicts that things are looking up for you. Your money troubles are all but a memory. Exciting business opportunities practically fall into your lap. Your horizons continue to grow and expand this year. Do not let others distract you from staying on your path. (Try the Muhurat calculator to find good timings to start new ventures). The Gemini astrology predictions 2015 foretell that your love life presents some minor problems. Love may come in the form of an already established friendship. Your relationships with friends and family deepen as you become closer. Let go of any past grudges and start anew. Your health remains relatively stable, with exception of a few vision and sinus issues. The Gemini sun sign is finally rewarded in the areas of career and finance. If you’re already in a long-term relationship, keep romance alive with little, unexpected surprises. The Gemini 2015 horoscope foretells that you need to give your partner some quality time by starting some ongoing dialogue. This open line of communication will make some minor issues easier to discuss in the early fall. Don’t neglect these issues by ignoring them. If you do so, they will only get worse and build resentment. If you are searching for love in 2015, the Twins need to be patient. It may be closer than you think and come from an unexpected source, perhaps an established friendship. Those closest to you are supportive of your new found successes. This is a good year for the Gemini zodiac sign people to get pregnant and expand their family. (Read more in the Gemini horoscope 2015). A younger family member seeks your advice regarding some rather private, touchy subjects. All your friendships improve and thrive this year. You will also make a few new friends and one of them becomes a lifelong friend. The 2015 predictions foretell that any tensions between you and family members disappear in 2015 and are a thing of the past. Take this opportunity to renew close ties and deepen meaningful relationships with those closest to you. In the area of career and business, keep doing what you’re doing in 2015. Your hard work and endless effort pay off in multiple ways this year. Some may question your new found success, but pay no attention to them, they are simply jealous. The 2015 Gemini horoscope forecasts that a promotion looks promising in late spring and with it comes a handsome pay raise. Do not take this promotion for granted. Enroll in some continuing education classes to keep yourself sharp and ensure you can keep up with new demands. Find a mentor and listen to them. They know what they’re talking about and their advice is sound. Keep looking forward and keep your focus. The Gemini 2015 zodiac forecasts predict that your career can soar to great heights if you maintain the path you’re on. Do not let others distract you. Your finances will greatly improve as a result of you moving ahead in your chosen field of work. (Try this financial horoscope reading). 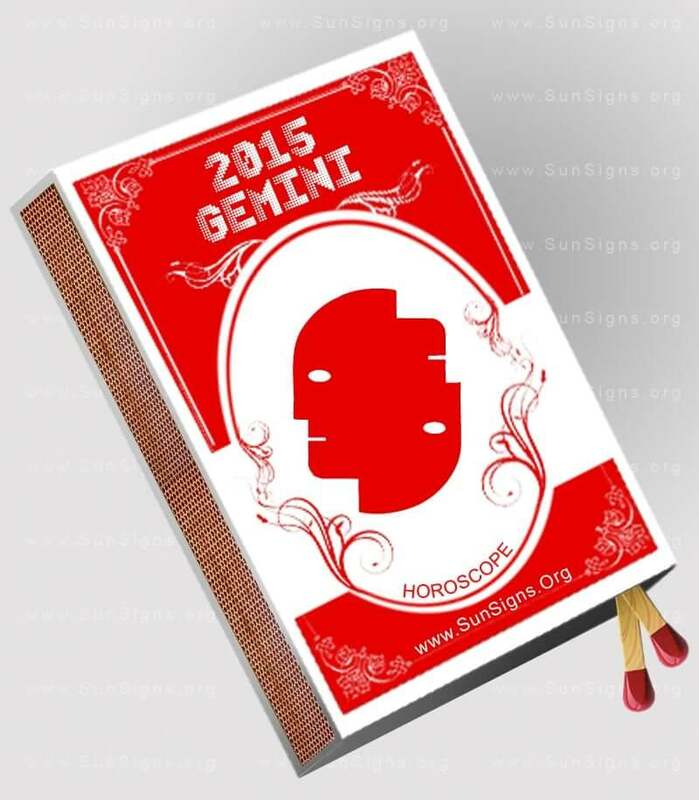 The 2015 Gemini horoscope foretells that you remain in general good health this year. Keep standing doctor appointments and dental appointments. You feel energetic and younger than your true age. Should any health issues arise, they will be in the area of vision and sinus cavities and the two could be inter-twined. Stay on top of your seasonal allergies in the coming year, as they will surely irritate both your eyes and nasal area. The Gemini health forecasts for 2015 warn you to continue to maintain your health through diet and exercise. In the wake of your career taking off, don’t neglect your mental health. Maintain your social circles and decompress with friends and family. Get out and stay active. This will be vital in order for you to handle the coming year and all the changes it brings with it. January 2015 might seem like a difficult month when nothing seems to be going right. But do not worry, things might not be as bad as they seem. February 2015 is a good month for the Twins to start working towards their goals. Do not let your impulsive or restless nature spoil things for you and your loved ones. March 2015 is an indicator of how much you wish to get out of your comfort zone. Mundane activities bore the Gemini zodiac sign. But do not do anything in haste as then you might have to bear the brunt of your actions. April 2015 might be a difficult month when it comes to emotional security and feelings for the Gemini. You need to let go of your inhibitions and move forward. May 2015 might be a big mess when it comes to communication with colleagues and family. People just might not understand what you are trying to convey. June 2015 is a good month to start working on your dreams. Do not let go of this opportunity to do what you have always been planning to do. July 2015 is all about confidence, positivity and enthusiasm in your career, finance and personal life. 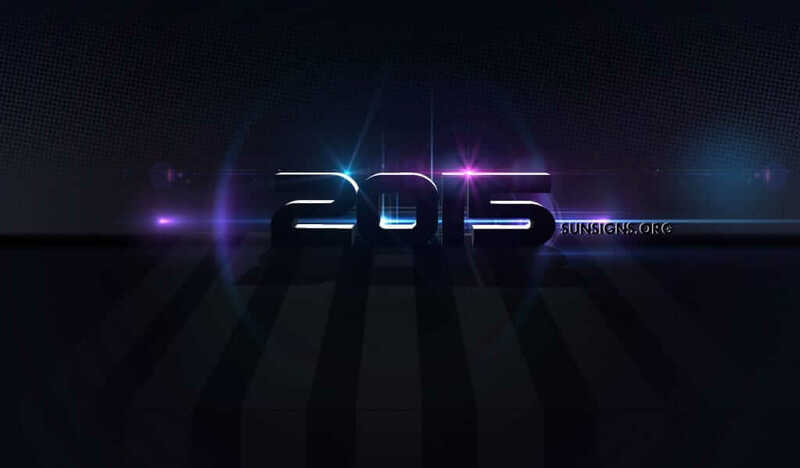 The 2015 horoscope foretells that you need to be sure not to get carried away by your success and remain stable. August 2015 is a month devoted to the renovation of your home. This is a good time to relocate and make major changes in your life. September 2015 will see you struggling on the domestic front. The 2015 Gemini horoscope predicts that it might be good to keep your insecurities aside and help your loved ones in their time of need. October 2015 calls for awakening from your dreams and understand people for what they really are. You might face some problems when it comes to your love relationships. November 2015 is a good time to take a break and go away for a few days. Going to a health resort with spa facilities could be a great idea. December 2015 will be a month when you will be busy with something or the other to the point of obsession. This is not a good sign and you need to take it easy. The 2015 Gemini horoscope forecasts that this will be an uncertain and elusive year. But all is not lost. Have patience and things will ultimately work out in your favor.